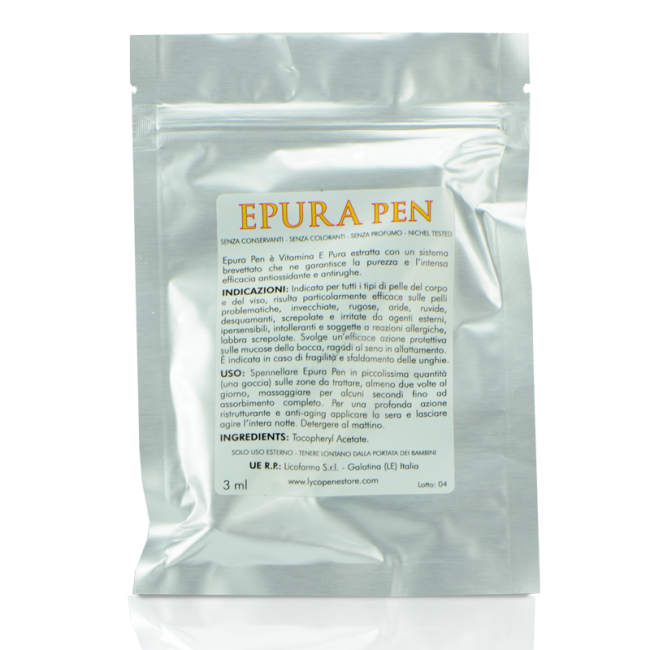 Home treatment based on Pure Vitamin E in the innovative click-pen Dispenser, for a practical, fast and immediate application. 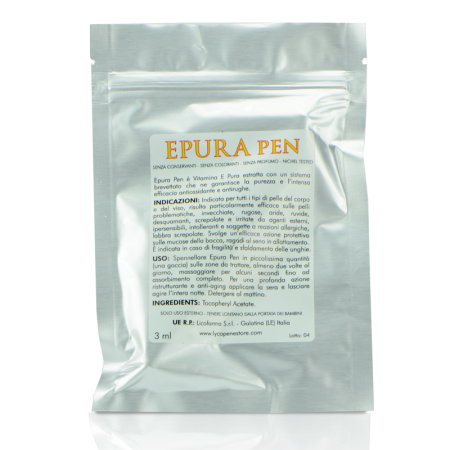 The Vitamin E contained in Epurapen is extracted through a patented innovative system which does not use chemical solvents for the extraction. The final product is certificated Pure, since it is free from any noxious and toxic extraction residual. Pure Vitamin E is a vital protection of the biological membrane of the skin tissues against the aggression of the free radicals, the main molecules responsible of ageing. It is also soothing on hitches, emollient, moisturizing, protective, antioxidant and anti wrinkles. It fosters the skin barriers. It can be used on every skin type and on every part of body and facial skin. Particularly effective on problematic, mature, arid, rough, exfoliating, cracked and irritated skin. Also indicated in case of fragility and scaling of nails. Thanks to its deeply protective properties it benefits sensitive, intolerant skin and prone to allergies. How to use: apply on the area to treat and massage for a few seconds until absorbed.